a gentle approach to teaching writing. 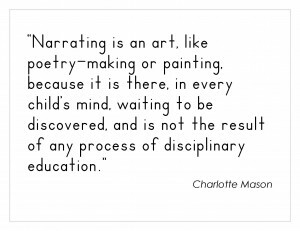 Writing Through History is a classical, Charlotte Mason writing curriculum. 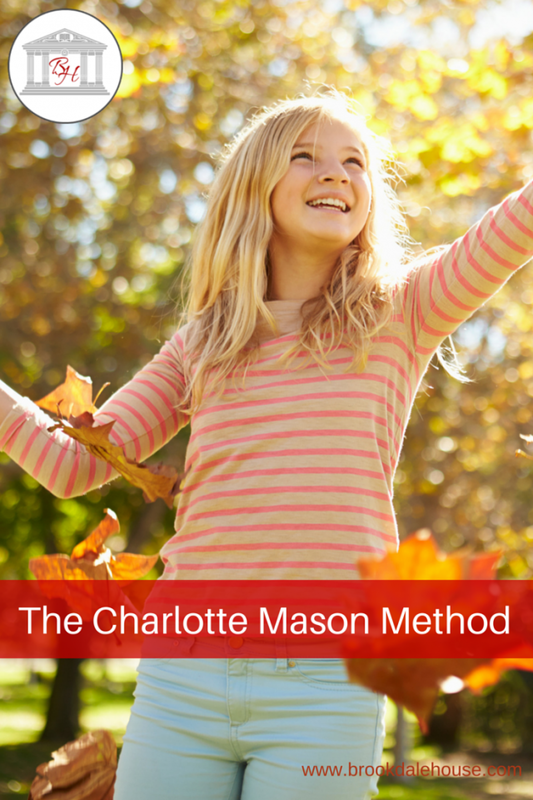 What makes the Charlotte Mason Method so different? More modern writing programs, geared at elementary students, ask students to write sentences about imaginary events or about their experiences. While these programs can be helpful, they don’t allow students to identify the areas in which they need to grow. Why? Some children have more difficulty with spelling. Some children have more difficulty with grammar. Some children have more difficulty with recalling information. Some children may have difficulty with the physical act of writing. Children’s weaknesses often overshadow their strengths. But there’s a fix for that: The Charlotte Mason Method! (That may have come off a little cheesy 🙂 , BUT… that statement is 100% TRUE!) When children are asked to perform all of these tasks at once, their weaknesses can overshadow their strengths. When this happens, students become very frustrated, making writing a difficult experience for them. Sometimes, children begin to think they hate writing! The Writing Through History series, however, addresses all of these problems. Because the Writing Through History series teaches children to write via the Charlotte Mason Method, children find writing to be easy and even fun. And when they are asked to put the various writing skills together, they do so easily and naturally. If you are interested in a little more background info on Charlotte Mason and this method, continue reading. If you would like to read more about what is in our books, you can learn more about the Writing Through History series here. 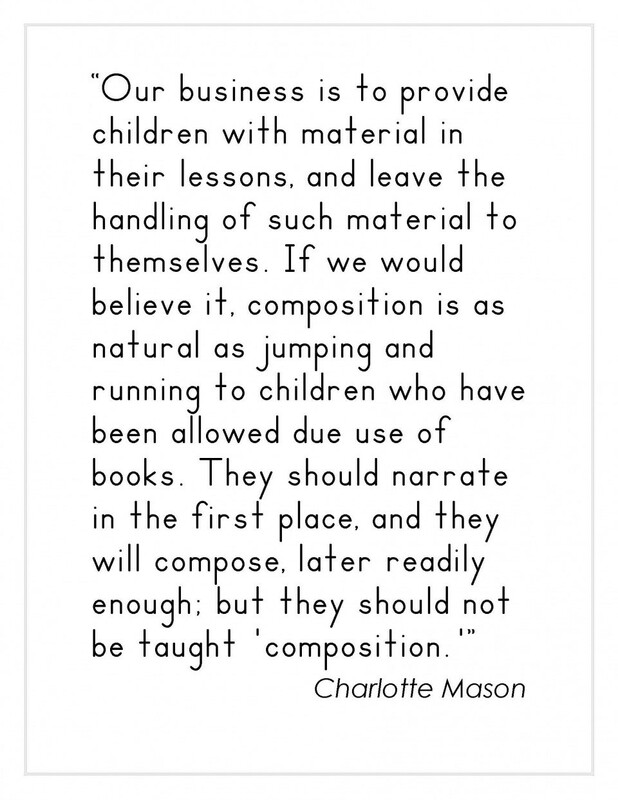 To put it simply, Charlotte Mason had unique insight into children and the way they learn, and it is the Charlotte Mason method of instruction that is the most effective method available to teach young students to write. 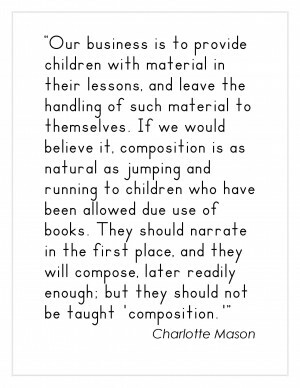 The beauty of Ms. Charlotte Mason’s method of writing instruction is that it is designed for the way children learn best. 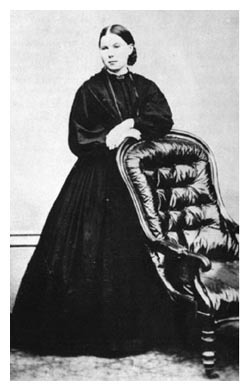 And the primary goal of the Writing Through History series is to imitate the Charlotte Mason method for today’s students. 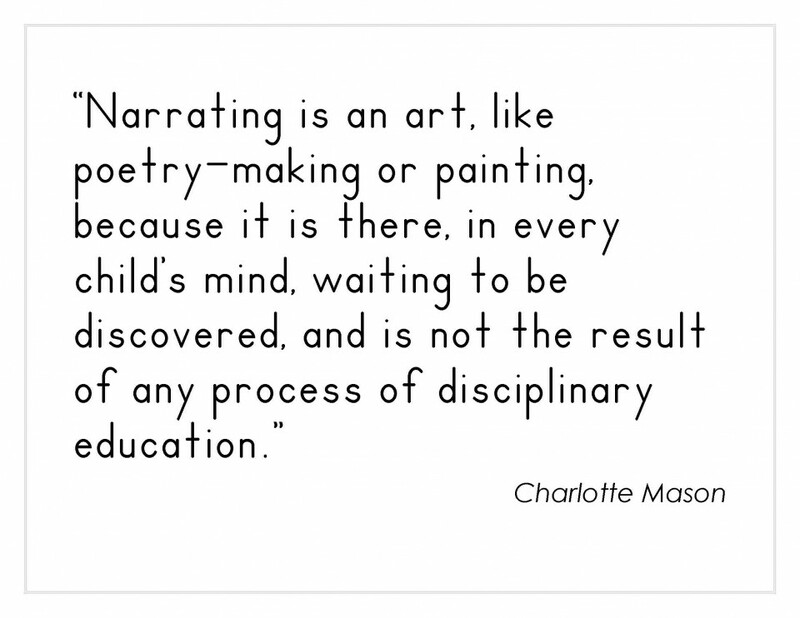 The fundamental principle upon which the Charlotte Mason method of instruction is built is narration. Narration is the act of retelling. Children learn to write by retelling narratives that they read in history, science, and literature. These selections should be thought provoking, enlightening, and engaging. Following this principle, the Writing Through History series incorporates historical narratives and intriguing historical selections from which children narrate. Because children are going to absorb what they are exposed to, the Writing Through History series exposes children to some of the best literature from ancient, medieval, early modern, and modern history. Because children learn what they read and what they read helps shape who they will become, the Write from History series includes educational, engaging, uplifting, and inspirational selections from history. Ms. Mason taught children to write via copywork. Her primary objective was to teach the children proper penmanship. But over the years, the benefits of copywork have proven to be far greater than simply handwriting exercises. By engaging in copywork, children digest the style of more seasoned, talented writers, and by doing so, they learn to create complex sentences. The models in the Writing Through History series, which are true font models which reinforce proper penmanship for beginning writers, were selected because they demonstrate sentence structure and style. A primary component of the Charlotte Mason Method of instruction is studied dictation. Studied dictation is different traditional dictation because students actually look at and intently study the models before they write them from dictation. This process has many benefits for younger students. It teaches them to identify words they don’t know how to spell. It teaches them to learn how to self-edit. Over time they will begin to know their weaknesses and work on ameliorating them before they write. It teaches them to actively study punctuation as part of their writing as opposed to punctuation being a separate topic. 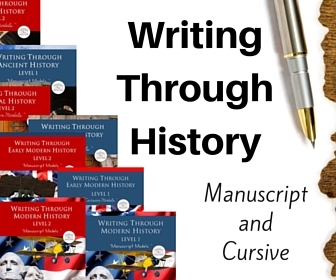 The Writing Through History series encourages and demonstrates studied dictation. 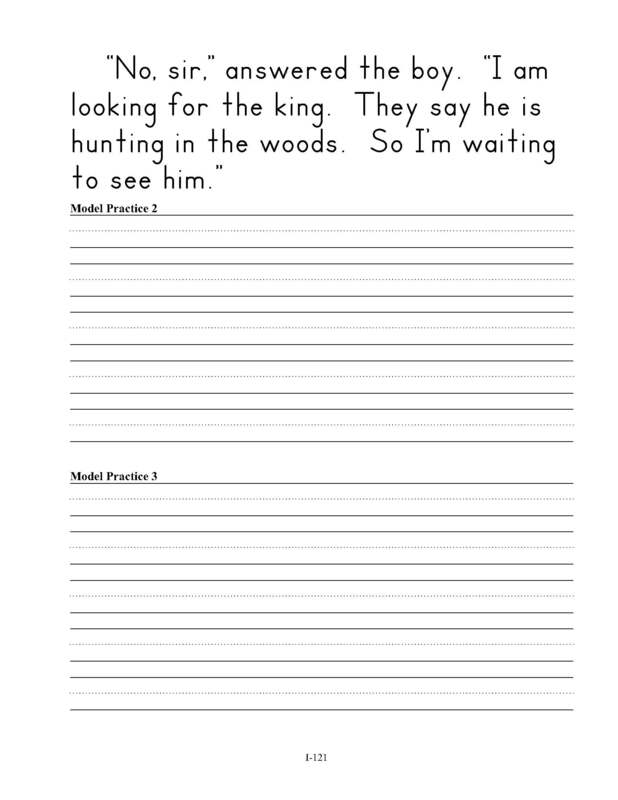 Students needing more practice may use their copywork models for studied dictation. For more advanced students, a separate selection of dictation models are included in the appendix. The Writing Through History series is an elementary writing curriculum for students in grades 1 through 5. Level 1 is flexibly designed for children in grades 1 through 3, and level 2 is flexibly designed for students in grades 3 through 5. This series teaches writing via oral and written narrations, copywork, and studied dictation. By using historical narratives, children are given interesting and important stories to narrate. By way of copywork, these same students learn the proper way to put words on paper, mechanically and stylistically. And via studied dictation, students learn to identify their weaknesses, self-edit, and write. Students copy age appropriate models written in a true handwriting font, and when the student is ready, he moves on to writing summations and writing from studied dictation. View the Writing Through History Series Now!